Food, Drinks, and Sights – Here’s Edinburgh in a Day. So, you’re in Scotland. Maybe you’ve got a stopover flight? Maybe you’re in Glasgow and want to see Edinburgh? Maybe you’re just a wild traveller who has a laugh at planning trips to the extreme? Whatever your reason, there’s a need for a day guide to discovering Edinburgh the right way! If you’ve got a day in Edinburgh – from the early morning to after sunset – our handy itinerary will get you through. 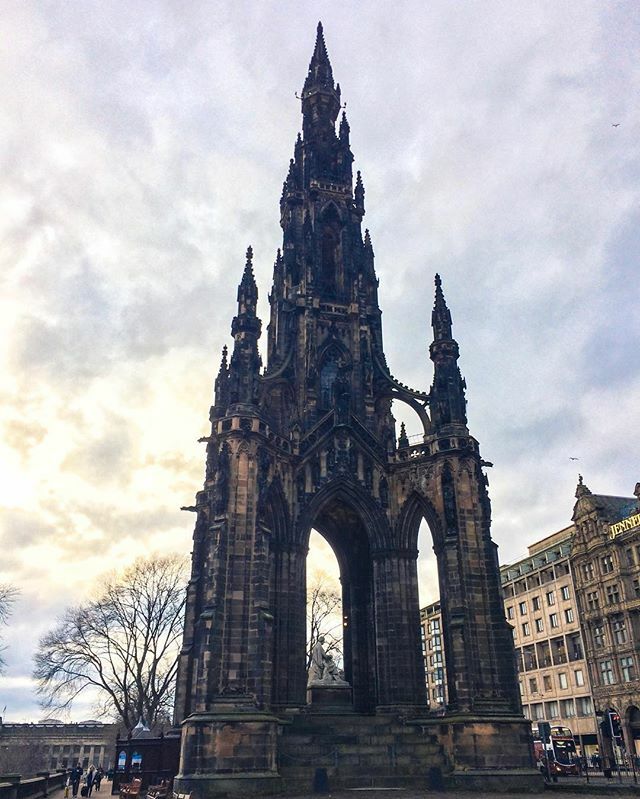 We’ve consolidated our favourite things to do, places to eat, and places to grab a drink from all the other posts on Edinburgh! You can choose to do some of them or all of them! Just remember to wear comfortable walking/hiking shoe – you’ll thank us later! 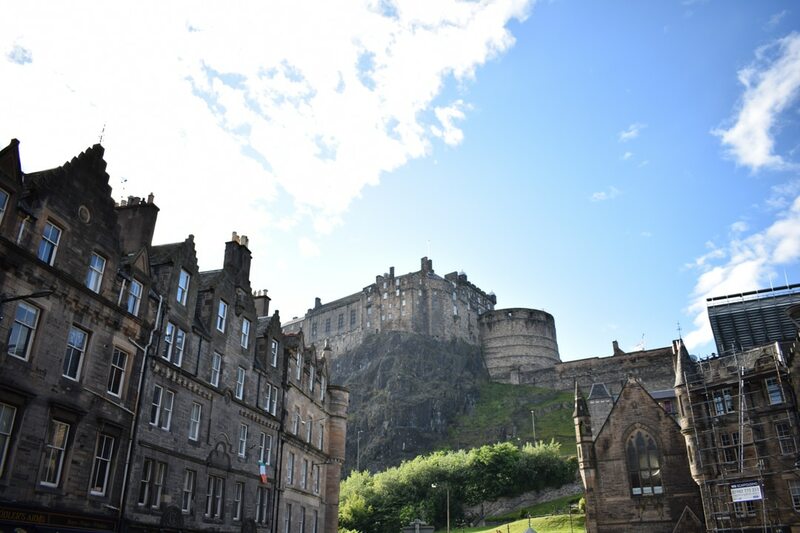 This post is Part 5 in the Ultimate Edinburgh Travel Series! We’ve had a blast making this series. 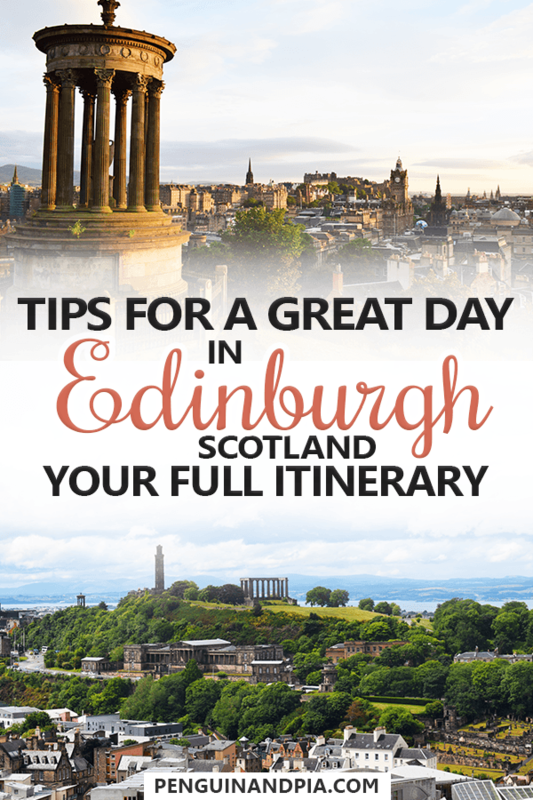 Check out the other posts below when you’re done reading this day guide to Edinburgh! Part 7: Edinburgh Day Trips to Explore Outside the City! Good Morning! Head down the Royal Mile and turn right at the bottom near the Scottish Parliament – you can’t miss Arthur’s Seat! There’s plenty of ways to hike up to the top so feel free to explore your own path. If you’re going in the early morning, be sure to carry a flashlight (also called a torch) with you. Be sure to layer your clothing as it can get chilly until the sun comes up. Even then, it may still not be the warmest! 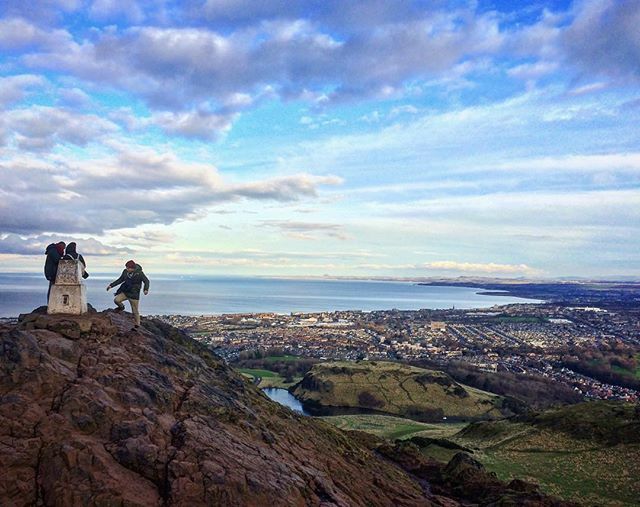 Climb down Arthur’s Seat and head over the hill in New Town towards The Pantry – Stockbridge. You’ll find waffles, bacon, eggs benedict, and a variety of lighter options like avocado on toast and things with fruit/berries. You better eat up because you’re going to need the energy to head out on your adventurous day in Edinburgh! Dean Village is always a great side trip in the city. 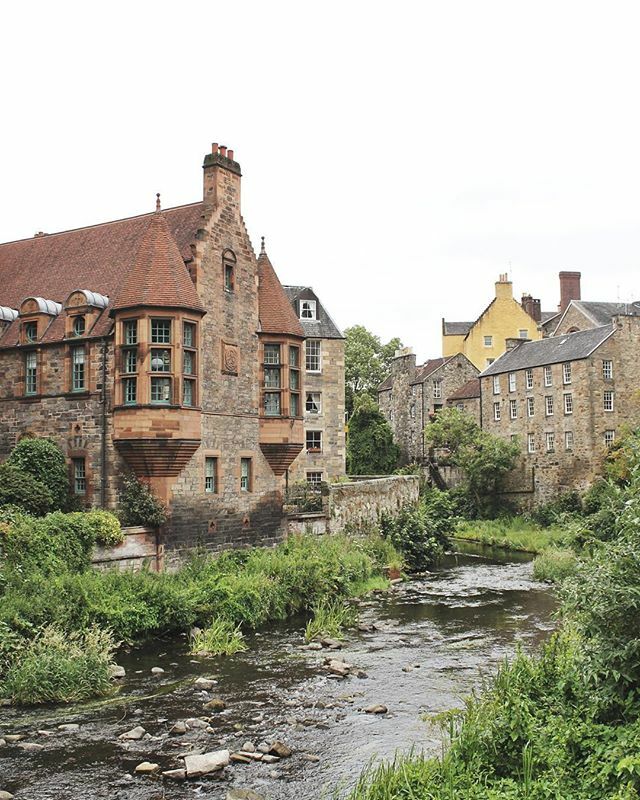 Wandering along the river makes you feel like you’re transported back in time – even further than if you are just walking around Edinburgh generally! The old houses and bridges make it a great spot to snap a few photos to post later and show all your friends the beautiful city. After Dean Village, head back into the Old Town to the famously colourful Victoria Street. There you’ll find Oink – a delicious small shop dedicated to serving a pork sandwich on a roll. The thing about Oink is that they have the barbecued pig in the store front window, and they pull the pork fresh from it throughout the day. Once it’s gone, it’s gone! Choose your size of bun, and add sage stuffing or apple jelly to your pork sandwich for an extra burst of flavour. Oink also has another location on the Royal Mile, should you want to head there! Be careful, these sandwiches can get messy! After eating lunch, head back towards the Princes Street Gardens and you’ll find a large black Gothic monument. Go climb it! Scott Monument is dedicated to Sir Walter Scott, a poet from back in the day. For 5 pounds, you can climb all 287 steps to the top and learn about some Scottish history along the way. The views get better the higher you go. At the top, you’ll have a great vantage point from within the city for amazing 360 degree photos of the area. Definitely worth the climb! You might get a bit cold on top of Scott Monument so come down and head to where South Bridge turns into Nicolson Street. You’ll find Back Medicine Coffee Co. – which is an amazing place to have a hot cup of coffee, tea, or a smoothie – whatever you like! Their food is also really good if you’re needing a small snack that’s sweet or savoury. Fun Fact: There’s a cactus in the front corner window in an orange pot. If you look on the pot, it says “Eric” on the outside. That’s “Hairy” the Cactus, and he “holds” Eric’s spot in his study corner of Black Medicine from when he lived in Edinburgh. 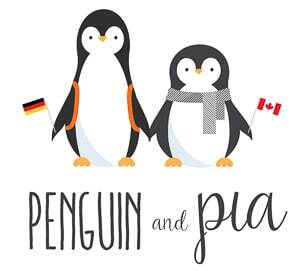 Snap a photo and show us if you can on Twitter @penguinandpia! 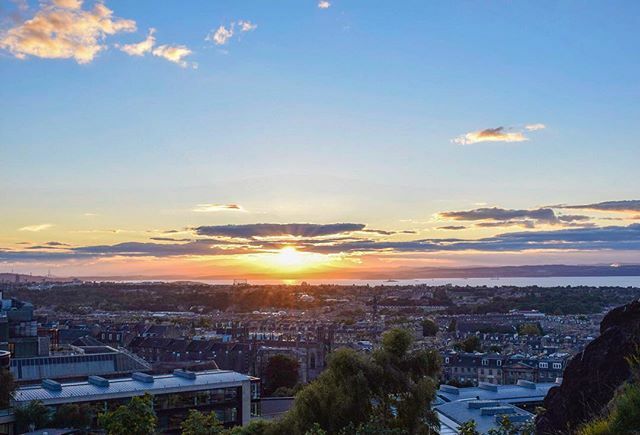 Nothing says “goodnight Edinburgh” like watching the sun go down from Calton Hill. The vantage point is a popular one for tourists and locals alike. Be sure to pack a coat because it might get a bit chilly once the sun goes down. It might also be raining in which case perhaps just stay at Black Medicine for a while longer. But remember, this is Scotland – the rain shouldn’t stop you! After your break and/or hike, you’ll head to The Holyrood 9A for their famous burgers, perfectly salted chips, and their awesome appetizer – deep fried haggis balls! If you’re looking to try haggis while in Scotland, this is a great way to do it. The appetizer is served with a mustard sauce to you can dip them to add to the experience of trying haggis! It’s actually quite tasty – if you can forget what’s in it! Whichever place you choose, you’re sure to have a nice beer, cider, cocktail, or scotch. The Queen’s Arms is a great gem tucked away in New Town, while the Last Drop might be a wee bit busy in Grassmarket. You could also find a completely different place on your own. There are MANY places to grab a drink in Edinburgh! Seeing Edinburgh in a Day is Possible! And finished! You tired yet? Admittedly, if you followed this point for point you’d be quite the busy traveller. We’d love to hear about if anyone can complete our entire guide! Let us know in the comments below – or take photos or videos of your day playing tourist in Edinburgh – we’d love to see it!